A line drawn on either full or half width across the road marking a stopping point for vehicles. A line along the road, marking the point in which a vehicle must stop, in junctions with traffic lights only. Is it permitted to transport cargo in a private vehicle? Yes, inside the vehicle, in the trunk(boot) or on the roof-rack.. Yes, provided that the weight of the cargo is no more than 1,000 kg. Yes, only on the rooftop cargo carrier. Is it permitted, in an urban road, to stop, stand or park a vehicle on the roadway or on the hard shoulder? 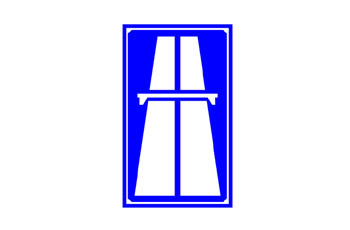 It is prohibited in any case to park on the hard shoulder. Yes, provided that the vehicle remains under supervision. Yes, when it is not prohibited by law or by any road sign, and when traffic is not disturbed. A policeman wrote you a traffic report due to “deviation from your lane”, and there are no lanes marked on the roadway. Is it justified? No, if lanes are not marked you may drive in any part of the road. No, you cannot “deviate” from an unmarked lane. No, you are permitted by law to deviate from your lane without any restriction. Yes, a lane can be either marked or unmarked. When are we not obligated to drive on the right hand side of the road? Is it permitted to use any means of visual display, which can be viewed by the driver, other than the vehicle’s G.P.S control and navigation display? Yes, to relax the driver and passengers. Yes, provided that the driver wears safety goggles. It is prohibited for as long as the vehicle is moving.. It is prohibited, even if the vehicle is parked. 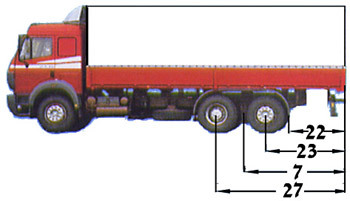 Which number marks the length of the “rear extension” of this vehicle? Which vehicle must be equipped with “safety blocks”? Any motor vehicle with an all up weight of more than 5,000kg, except for a bus. Any motor vehicle, regardless of its weight, except for a bus. Any vehicle with an all up weight of 3,500kg or less, except for a bus. Only a vehicle with an all up weight of 4,000kg or less, including a bus. 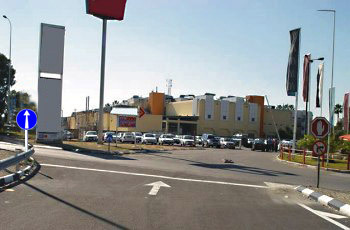 According to the following picture, is it permitted to make a U-turn? Yes, when the turn can be completed in one continuous movement. Yes, from the left side of the road. Yes, provided that the turn is made carefully and without causing any traffic disturbance. When is a driver obliged to signal? When he approaches a level crossing with a barrier. When he intends to change his driving lane. When he arrives to a long uphill drive. When he arrives to a steep descent. When are we not obligated to drive on the far right side of the right lane? When turning left from a single-lane, two-way road. How are you required to conduct yourself when a traffic light displays a green light but the intersection is blocked by vehicles? It is prohibited to enter an intersection when the exit is blocked. Cross the intersection as quickly as possible. Follow the green light and enter the intersection. What is the statutory speed limit (in k.p.h) of a private minibus on a freeway (unless indicated otherwise by another road sign)? When may a driver be in possession of only photocopies of his original vehicle documents? It is only permitted when the vehicle is owned by a corporation, and the photocopied documents’ validity is authorized by the safety officer’s signature and stamp on them. Which of the following vehicles may enter the intersection first? The closest vehicle to the intersection. The vehicle turning left (3). How would you (vehicle no. 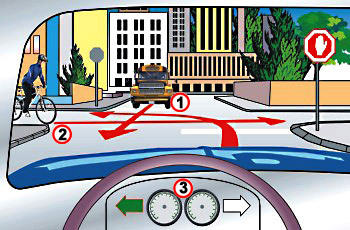 3) conduct yourself in the following intersection? Give right of way to the motorcycle only (2). Give right of way to the motorcyclist (2) and to the yellow bus (1). Give right of way to the yellow bus only (1). Drive forward carefully. The other drivers (of vehicles 1 and 2) must yield. What would you do if your driving lane is obstructed? Quickly cross the obstruction from either its right or left. Drive slowly and disregard the road signs that are posted in the place. Cross the obstruction from the right only, and vehicles approaching from your front are supposed to give you right-of-way. Obey the signals that are given by a policeman, a signaler or a road sign. Non-handicapped drivers are permitted to use the handicapped parking spaces for a short while, as long as they leave a phone number in which they can be reached at any moment. 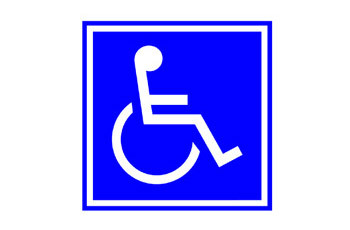 Non-handicapped drivers are permitted to use the handicapped parking spaces for a short while, as long as at least half of these spaces are free. Non-handicapped drivers are permitted to use the handicapped parking spaces for a moment, as long as they stay in the vehicle while it is parked. When is it permitted to use the “white reversing light”? While driving in reverse, combined with the reverse gear only. While parking in a roofed parking lot. When visibility is poor for any given reason. During fog or pouring rain. Which of the following is an emergency vehicle? 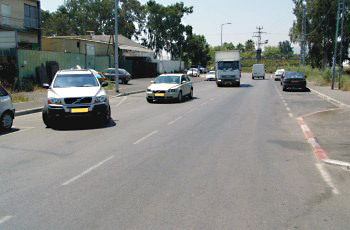 A Red Magen David Ambulance, an Israel Police vehicle, IDF vehicle, Fire-fighting vehicle, integrated policing vehicle or any other vehicle approved by the Authority, when it sounds its emergency signals and operates flashing lights and sounds an alarm signal. When is a driver required to drive on the “hard shoulder” - where the “shoulder” is asphalt-paved and free of traffic - in order to allow another vehicle to overtake him? When the vehicle drives very slowely for any reason. Only when the vehicle is forced to drive slowly on a steep uphill climb, and disturbs the free traffic. When a driver of a motor vehicle is forced to drive very slowly due to the freight he’s carrying or to the steepness of the road, and he delays the traffic behind him. Never. It is prohibited to drive on the “hard shoulders”; hence, a vehicle that delays the traffic behind it should pull into the “hard shoulder” and stop, to allow the traffic congestion behind him to open up. When are we not obligated to drive a private passenger car in the right lane? When another vehicle overtakes us from the left. When you pass another vehicle from its right side. When the right lane is designated for another type of road users (e.g. public transportation lane). When another vehicle that is driving on the left side of the road signals about its intention to start drive. Stopping and parking are unrestricted, unless any appropriate road sign is placed. Parking and stopping are prohibited, even on the “hard shoulder”. Stopping and parking are permitted in parallel to the sidewalk only. Stopping is permitted for buses only. Is it permitted to stop, stand or park a vehicle on a freeway (motorway)? Yes, provided that the road edge is wide enough. No, unless otherwise specifically sign-posted. No, except for a public vehicle. Which documents should a driver be in possession of whilst driving? According to the law, how should you (vehicle no. 3) behave at the following intersection? 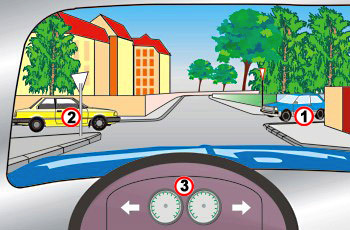 Give right of way to the blue vehicle (1). Cross carefully. 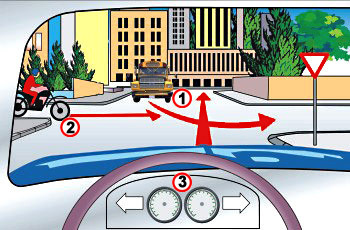 The two other drivers should yield (3). Give right of way to both vehicles (1,2). Give right of way to the yellow vehicle (2). How would you seat a child more than three years and less than eight years of age inside a vehicle? In a safety seat or in a booster that fits his height and weight. Wearing any of the vehicle’s safety belts. Only in the vehicle’s back seat. Wearing a three-point safety belt. When is the driver of a private vehicle exempt from wearing a seat belt? While moving forward during parking maneuvering. While exiting a roofed parking.